Why is Fighting Allowed in Ice Hockey? A complex system of unwritten and unofficial rules called "the code" has allowed fighting in ice hockey. 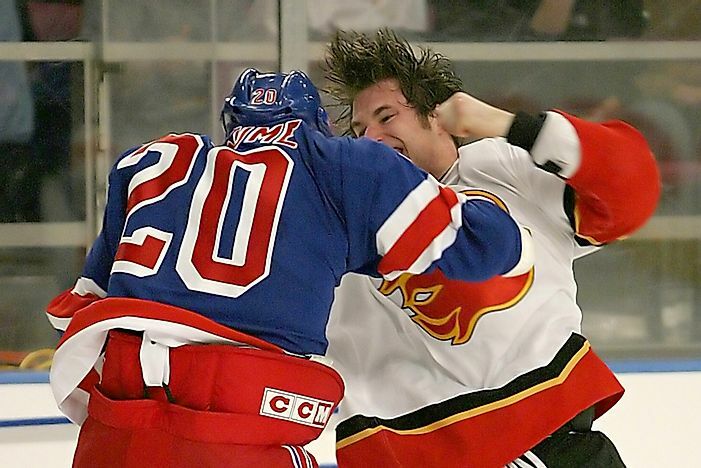 The frequent fighting tradition in the amateur and professional ice hockey has been a part of the sport for many centuries and the fans love it when individuals or teams fight. Contrary to popular belief, fighting is punishable in the game although it is tolerated. The fines are minor, commonly five minutes out of the game. This situation is different in other sports where fighting attracts suspension, ejection, and huge fines. The fighting culture in ice hockey goes by the name “the code” in what officials say is allowing the game to police itself by making somebody pay the consequences of doing something bad. Some fights are light while others are serious and lead to spilling of blood and harm to body parts. Since the early 1900s, fighting in the sport has been on the decline as the game develops and more rules are put in place to protect players. From the beginning of the sport, fighting became inevitable because of the sport's competitive nature, player’s emotions, and the equipment’s they use. There are different reasons given as to why fighting occurs, including lack of rules during the early development of the sport and crime and poverty in Canadian neighborhoods where the sport developed. The inclusion of the blue lines in 1918 that allowed forward passing in the neutral zone increased physical play that further favored fighting. In addition, the introduction of enforcers to protect puck handlers only worsened the situation. In 1922, NHL introduced "fisticuffs," otherwise called Rule 56, that gave a five-minute penalty to fighting players rather than ejecting them from the game. By this time, different interest groups had devised marketing strategies focusing on the rivalry of NHL teams consequently increasing the public’s interest. Between 1920 and 1960, fighting was rare but brutal. Additionally, NHL witnessed the signing of more enforcers who possessed the least gaming skills to protect their skilled offensive stars. The number of fights rose in the 1980s and teams responded by signing more enforcers, however, from the 1990s onwards, fighting reduced as teams went for skill and skating ability that saw a reduction in the number of enforcer and an increase in the number of young players. Since fighting is inevitable, specific rules guide the sport to ensure the safety of the players. For starters, at the beginning of a fight, both players must drop their sticks that could otherwise be weapons and remove their hard leather and plastic gloves which might increase injury. Players never discuss the rules but take them seriously, especially the etiquette. For a fight to begin, the opposing enforcer must agree to a fight verbally or physically, and therefore an enforcer can easily avoid instigator penalty while also excluding unwilling fight participants. Enforcers fight each other and equally respect each other to an extent that they will not fight an unwilling enforcer or an injured one. Fighting an injured enforcer dents an enforcer’s ego, and so is fighting an enforcer who is about to end his shift because he is tired. Fighters also hold the opponent’s jersey and fight with one hand to maintain balance on the ice. Players in the fight must lose or win gracefully, otherwise, they may lose their fan’s and teammates’ respect. Lastly, one must not fight or injure referees or linesmen or start a fight against an opponent who scored fairly. To prevent the fights, officials should also guide the game fairly calling all the fouls. When a fight breaks out, the officials communicate to each other on which player each will take while clearing any sticks and dangerous objects and only separating the fight when it is safe, however, they must immediately separate a fight once a player gains a significant advantage over the other. All this time, the referee should record on the riot pad who to give a penalty. Once the referees separate them, the fight must end and failure to follow these rules lead to a misconduct penalty, suspension, or even fines on the player and sometimes the coach. These rules and penalties slightly vary with the league and competition. Factors that led to a reduction in fights include the replacement of "fisticuffs" with Rule 46 giving referees more power and the creation of the "Third Man In" rule which aimed at eliminating bench-clearing brawl by enabling ejection of a player who joins an already progressing fight. There is also a rule to suspend the first player from each team who joins a fight from the bench when not playing. As from 1992, NHL introduced the “Instigator rule” that gives the fight starter an additional two-minute penalty. Fighting is not allowed in Olympic hockey, with the starting fighter receiving a match penalty and ejection. Other players can receive minor penalties for retaliation, game misconduct penalties for intervening in a fight, or misconduct penalties for the removal of gloves during a fight. In addition, plays who continue to fight once having been told to stop by officials can lead to a double minor penalty, major penalty, and game misconduct penalty or match penalty.